Research your ideas on websites like Houzz.com, BHG.com, and landscapingnetwork.com. If you want a living area and a separate eating area, measure the space inside your home dedicated to those two activities to give you an idea of how much space you will need outside. It probably goes without saying, but take into consideration our brutal Texas summers and sunsets. Plan for shade and relief when the sun stands directly overhead or is setting. 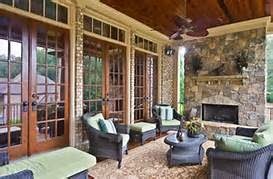 Existing patios are usually the foundation of your plan. Can your current patio be made longer, wider, more sheltered or more comfortable? Do you want an outdoor dining patio, a living room patio, a bistro patio, or a sundeck? Consider a source of fire as an essential element. Fire draws conversation and interaction and creates an unmistakable ambiance. 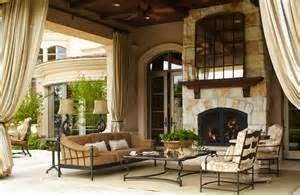 If you can afford it, a fireplace remains the most natural addition and adds the most to your property value. However, if space or budget present an issue, fire pits come in an amazing array of shapes and sizes. Fire pits also offer 360-degree access and--depending upon the design--the convenience of portability. Evaluate how your design will integrate with your home's current exterior or existing elements such as pools or retaining walls. Remember that elements can be added in phases if a complete plan is created at the outset. Take into consideration adding various heights to your project to add character and color to a flat landscape. Levels create layers of interest. 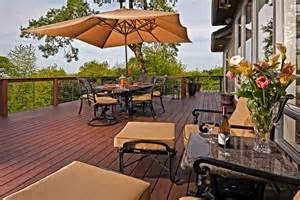 Stained concrete remains the favorite in outdoor flooring. It's reasonably priced and can be used in countless creative ways. However, remember that it does require maintenance and must be sealed every two to three years. When planning the timing of construction, remember that HOA and city permits may be necessary and can take weeks. Consider adding landscaping to create a privacy screen for your outdoor living area. As you use your back yard more frequently, you will probably want more privacy. You will also want to make sure that your activities don't infringe on your neighbor's enjoyment of their space. 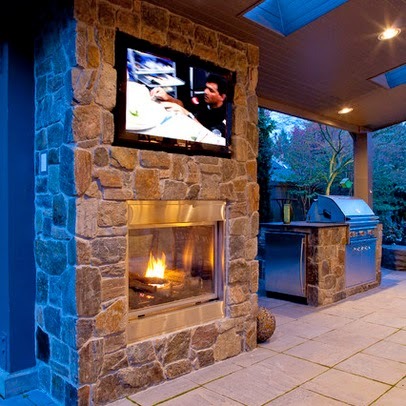 Televisions are becoming a more important element of outdoor living. Their location should be very carefully planned to avoid noise and light pollution of your neighbor's space. When you consider adding any home improvement, consider calling an experienced agent on the Grove Team to discuss possible costs and plans and how they will impact your home value.